Gun Review: FMK 9C1 Gen 2 | Gem or Junk? FMK is not shy about showing their patriotism and love of the Armed Forces. 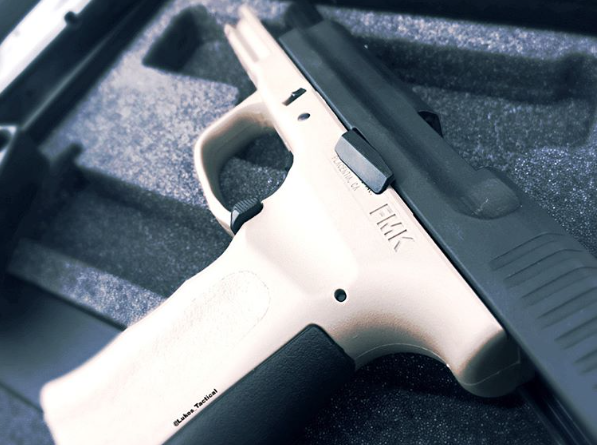 Some people who have shot the FMK 9c1 Gen 2 have deemed it the ‘American Made Glock' and the company itself has made some pretty bold statements about how well it performs. I wanted to see for myself just how this 9mm pistol stacks up to the many others I have fired over the years. You may have never heard of them before because while they are by no means a new firearms manufacturer, they don't have the same exposure as the big names in the industry. FMK Firearms is a company based in California that basically only produces two models, their 9C1 G2 semi-automatic handgun and a 9mm AR Carbine named the JRC. 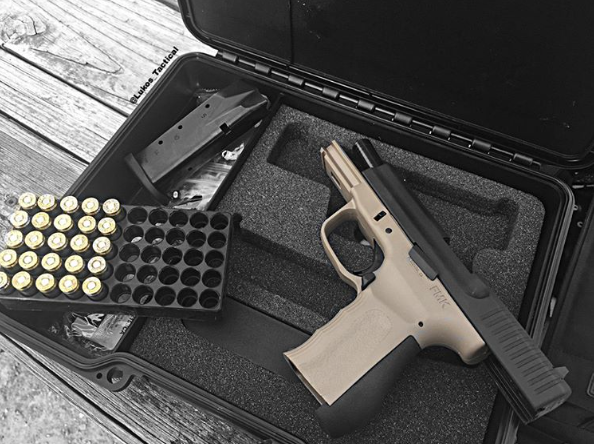 This FMK 9mm Pistol is their take on the Glock 19, and when you compare the dimensions of the two guns, it gives you an idea of just how similar they are. They are both made from polymer, are semi-automatic compact firearms, and chambered for 9mm. They have a similar capacity at 14 and 15 rounds, respectively. While the barrel lengths are very similar, the 9C1 comes in with a slightly smaller footprint than the Glock 19 and is a bit lighter. The similarities between the two pistols do not end at the dimensions. The procedure of disassembly for the 9C1 is exactly the same as that of a Glock. If you're a lefty you are out of luck, because just as with the G19, the magazine release on the 9C1 is not ambidextrous and is only set up for right-handed shooters. The FMK 9C1 Gen 2, like the Glock 19, comes with a rail so you can mount that pistol light or if you want to take your training to the next level and analyze your shooting fundamentals, you can use the rail to mount your Mantis X. The overall ergonomics of the gun are similar to a Glock, and if you like the grip angle and slide height of Glock's pistols, you won't have any trouble transitioning. While there are plenty of similarities, there are also some major differences, like the shape of the slide. Glock slides are utilitarian and boxy. While they are not pretty, they serve their purpose well. The 9C1's slide has a much different shape and profile. It has a tapered angle on top, making it slightly more narrow along the top surface. There are also adequate serrations on the rear of the slide behind the ejection port. The 9C1 has a loaded chamber indicator on the back plate, which is very easily seen as well as tactile for low-light chamber checks. Finally, the slide stop is very long and serrated, making it easy to engage and disengage. That black colored section of the backstrap is a rubber insert that is not removable and was added to help with felt recoil and grip comfort. It also has shallow finger grooves on the front of the grip, which some folks love, and others hate. The FMK 9mm Pistol is unique in that it ships with a different trigger depending on what state you live in. For those of us living in freedom, the 9C1 ships with what is called their Fast Action Trigger (FAT). The FAT is your typical striker fired 5 lb trigger with a trigger safety built into the trigger shoe. For those living behind enemy lines, i.e. California and Massachusetts, the 9C1 will come with a double action only trigger. And of course, for those states where carrying more than 10 rounds causes politicians to lose their minds, FMK will ship neutered magazines that make sure you are in compliance with the local law. A final, important difference is the price. The FMK 9C1 Gen 2 comes with an MSRP around $400.00 while the Glock 19 gen 4 is around $550.00 dollars. For some, $150.00 dollars may not seem like a huge difference, but when comparing them, it is important to understand they do fall into different price categories. That leads us to these questions: Does a lower price mean cheap and unreliable? Does that saying, “you get what you pay for” mean anything here? If I spend more will I get a better product? First, and this is probably quite trivial, the box the gun comes in is cool. Not only does it have a ton of padding, but as you can see, the box has a spot that will easily accommodate cleaning gear and a box of ammo. Something that I think is great, is that the gun comes with two sets of sights, which, to my knowledge, is unique and a nice addition. This FMK 9mm pistol also comes with a bottle of CLP and the required cable lock. I was actually blown away by the quality of the owners manual. The 54 pages of color instruction describe everything you could possibly want to know about the firearm as well as the company. Finally, they also provide two 14 round steel, flush magazines with the gun. The gun I was sent came with a Flat Dark Earth (FDE) frame, but they are available in five different colors. I liked its look and shape, and it was pleasant on my eyes. The dull, parkerized-like coating on the slide seemed to provide an exceptionally good grip. The angles of the slide were subtle and I found that the serrations were deep enough that they did their job. The frame felt like any typical polymer gun does, and was ergonomically correct. The area where the trigger guard meets the frame is cut higher than what I am used to on a Glock which allows for a higher and more comfortable grip. There are finger grooves on the front of the grip, but they are relatively shallow, especially when comparing them to a Glock. I found the texture on the grip to be perfectly acceptable, not too rough or too slick. I have small hands, and I found the magazine release to be quite easy to operate. I could easily reach it without having to adjust my grip or reach for it, and while I have seen people complain about the magazines not dropping free from the gun, both of mine dropped free whether they were loaded or empty. What's kind of funny is that I loved the slide stop so much that I mentioned to a fellow instructor that I wished I could put it on my Glock. It's longer and serrated so you can easily engage it, but at the same time it is very streamlined and does not stick out far. Maybe I'm old-school, but I prefer to do a brass check to confirm that I have a round in the chamber rather than rely on a device. However, the loaded chamber indicator works well, and some folks love them. I read somewhere that the tabs used to take the gun apart have caused people problems because they are more recessed than those on a Glock. I honestly found no difference between them and was able to disassemble the gun without an issue. I found the trigger to be pretty soft and have quite a lot up uptake. There is no crisp ‘wall' that you will feel before the trigger breaks and the shot is fired, but the reset was actually pretty short and sweet. If I were to compare a stock Glock trigger versus the FMK's Fast Action Trigger, I would say that the Glock's trigger feels better out of the box. To what degree is it better? To me, the stock Glock trigger isn't much better than FMK's is. Then again, trigger feel is definitely subjective in many ways. 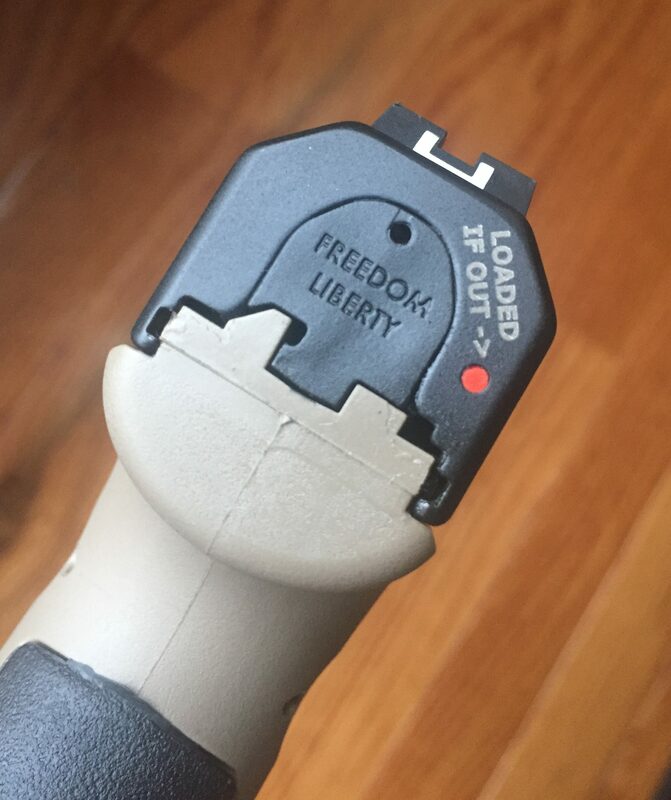 I have pulled the trigger on many different manufacturer's guns, and have felt far worse triggers than this one. It may look like the 9C1 has interchangeable backstraps like the gen 4 but it does not. The black part of the backstrap is a dense, rubber insert that was added to reduce felt recoil and give the shooter some comfort. I'll let you know about this unique feature in my conclusions. Now, where the Glock does have a leg up on the FMK is the fit and finish of the frame. The slide was pristine and like I said I liked the finish. The frame, however, had some finish details that were not as refined. There were a couple tiny marks from what I would say are seams from the injection molding process, and the base of the grip (under the mag well) is not as smooth as the Glock. All of this is purely cosmetic and has no bearing at all on the function of the gun, however, I like to dig with a fine tooth comb for pros and cons. Is this the American made Glock? 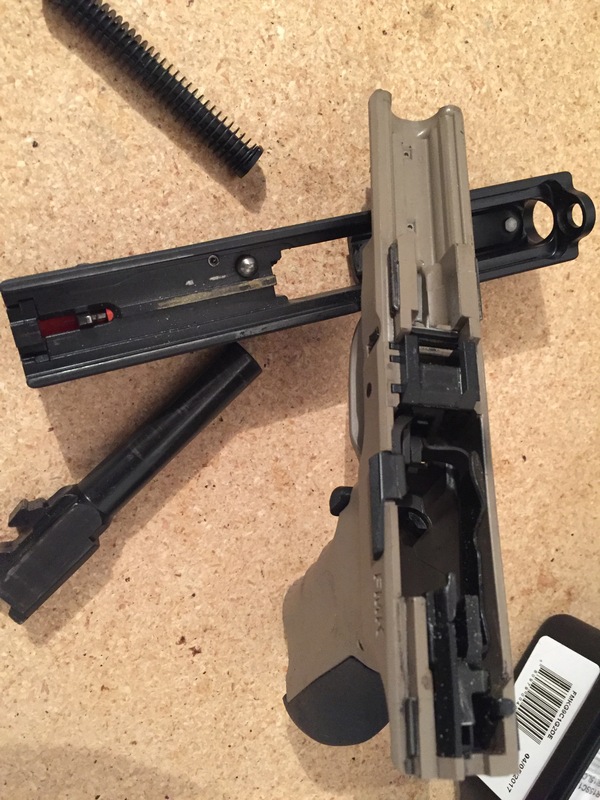 Lastly, and I wasn't entirely sure where to stick this part, but it bears mentioning, the Glock has a thick, metal guide rod, whereas the FMK 9C1 has a guide rod that is thinner and made of polymer. A co-instructor, Mark and I put close to 400 rounds through the gun (as you can see by the dirty gun in the pictures). I found the reliability to be outstanding. Early on, I had one failure to eject (stovepipe). Not exactly sure what caused it, or if it was somehow shooter induced, but that was the only stoppage of the entire day. I was waiting for the gun to have some hiccups here and there but it ate the FMJ ammo like a champ. The ergonomics felt incredible and we were both amazed at how natural it felt in our hands. I think it is important to note that Mark has hands that are quite large, and mine are rather small. I say this is important because the gun felt fantastic in both sets of hands. The rubberized backstrap insert gave the grip a nice ‘soft feel' and didn't cause any fatigue on the hand. This can sometimes happen after shooting hundreds of rounds with guns that have aggressive grips. The sights were just your standard, factory sights. Nothing out of the ordinary there, however even at around 25 yards plus, I was easily able to consistently hit a 6-inch steel plate. Again, several looks back and forth between Mark and I trying to figure out how it was possible this budget gun was running so well out of the box. You can see some of the shooting in the accompanying video. I have shot many different guns over my time instructing. One thing they all have in common is that none are flawless. All guns, regardless of price or manufacturer, have some things that are good and some that are bad. The FMK 9C1 Gen 2 is no different. Is it perfect? No, I found some finish issues that would really make the gun look more refined. Was it 100% reliable? Well no, I did have one failure, which is well within acceptable standards considering the gun had never been fired before. One thing I needed to get an answer to was how the rubberized backstrap would hold up with wet, sweaty hands. The fear was that the rubbery material would become very slick when wet. I found that the rubber did not at all become any slicker than the rest of the gun when my hands were wet. In fact, I would say it retained grip better than the bare polymer with wet hands. I have read some reviews saying they have had reliability issues with this 9mm pistol and that their magazines did not drop freely. I did not experience any of these issues and perhaps the users who experienced these issues had older models or just got a lemon (it does happen). What I can tell you for sure is that for a $400.00 gun, this exceeded every expectation I had. It functioned, felt great in the hand, ate different types of ammo, was accurate and in my opinion, looked darn cool. By the way, if you're still wondering how patriotic FMK really is, the 9C1 comes with this super motivating back plate! 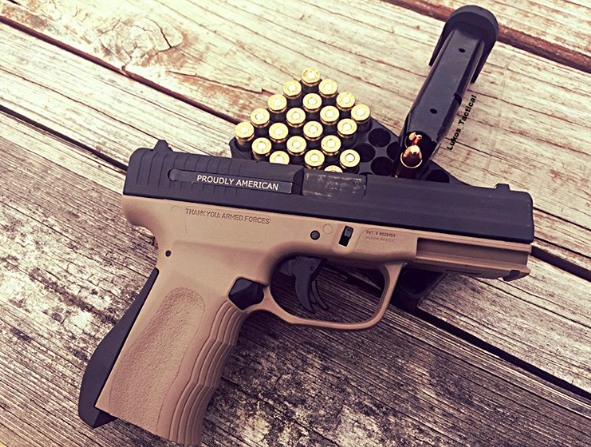 Need help deciding on a gun for self-defense? Check out this article, and learn about some of the factors to look for. 29 Responses to Gun Review: FMK 9C1 Gen 2 | Gem or Junk? I own an FMK 9MM. Never again will I buy one of their guns. It’s a total waste of money. The first time i shot it, it jammed on me 5 times and I only shot 50 rounds. Thinking it was new i gave it the benefit ot the doubt. second time again. So called the company told them what happened. Took their advise on what to do still kept jamming up. Now it sits in my safe. Went and bought a Smith and Wesson and I love it. Their customer service isn’t any better. I bought this gun in the Gen2 Bill Of Rights model. I bought it because it was cool looking and a collectors piece. Shooting it is fun and no failures except using the Winchester white box ammo and only 1-2 failures per 100 or more rounds. The gun ran cheep Remington yellow box like a champ, 500 rounds no failures. Hell my Glocks even had a few failures on some ammo. I do a lot of shooting ( at least 3 times a week) and I own 5 Glocks and a few XDs and I will say FMK runs just as hard as any of them. Is it a perfect gun? Nope but the price might hint to that, but the FMK is my most fun to shoot and I take it to the range the most. Would I make this a carry gun of mine? Not as of yet due to not putting any defense rounds through it, Plus the caliber is to small for me as a carry gun. I will stick to my G30 for now on a carry gun. Bottom line fun gun to shoot and show off. This gun and company should fade into the sunset and hide in shame. They flaunt MADE IN AMERICA but don’t have the quality to back up that selling point. The 9mm I own has stovepiped at an alarming 10%. 25 out of 250 rounds failed to eject in on way or another. Do not rely on this as a means of self defense. I have never shot such a piece of garbage in my entire life. The article says it is only $150.00 difference in price for the Glock. BUY THE GLOCK. I spent about the same amount on Smith and Wesson M&P Shield LOVE it. I sincerely hope FMK goes out of business so other people don’t make the same mistakes I did. I have a gen2 and never had a problem a problem.It didn’t like Winchester ammo but that was clearly stated in the owners manual,I just had to try it because they said not to and I wanted to know why. I like the gun and would buy another if it cam out in .45 acp. My wife and I both own one of the FMKs. Here’s is Tiffany Blue and mine is Flat Dark Earth. They function very well and are incredibly accurate. I was even able to hit a coyote at nearly eighty yards! Lucky shot for me, because I’m not that good of a shot. I’m glad the pistol was! There are so many reasons to choose the FMK, especially over the Glock. The article didn’t mention how the machining of the metal components are very well made and also how it conceals (for personal defense carry) much better than many other pistols in its class. I know of other people who have the FMK. Basically, the only time I’ve ever heard a negative report on this pistol, is on the Internet. Hmmmm? I’m glad this article was objective and fair. Even if I had not agreed (with I do), I can always appreciate fairness. What holster did you purchase? I am on the market for a new holster and am interested what others have. I use a CYA IWB made for a Glock 19. I took a heat gun to it and now it fits like a glove. That FMK and G19 are so close in dimension that you can use Glock 19 holsters. I bought the fmk Gen 2 9mm and I was having trouble with the shells being ejected. their customer service was very helpful also I even drove down to there shop and had my gun fixed with in 20 minutes and I have put about 1000 rounds in it after being fixed and have only jammed 2 times. Love my gun grate deal on it and my accuracy is dead bullseye. My next thing that I will be getting from them hopefully will be the Truglo fiber optics Thank you once more FMK for such great customer service. Customer for life. I bought one of the originals, sent it back for the factory recalled trigger and that’s the only issue I’ve had with it. Their customer service was great and easy to work with. Like a previous comment, I tried the Winchester white box and mine lives it, go figure. Had a few jams in the first 250 rounds and none since with over 2000 rounds downrange.. I reload my ammo and my 9C1 has taken everything from 105gr to 147gr with zero malfunctions. More accurate than I will ever be too! Very finicky with ammo…in fact, we returned it to the factory to have it rebuilt after it was jamming about every third shot (stovepipes, failures to extract, and even an occasional double feed). The new issue is that about every other magazine the firing pin strikes THROUGH the primer, piercing it but firing the round. Wayne, where did you find the 20lb replacement recoil spring. I would love to change mine out. Any help would be appreciated. Just got my FMK threaded barrel. Took it out of the box, manually worked the slide about 500 times, then took it out to shoot. I shot 100 rounds, my reloads, on the light reload side, not a single problem. My wife then shot it. I guess she limp wristed it because she had a few failed to feeds. I shot it again after that with no problems. I like the gun, I would concealed carry it, and I would recommend it . I have Hot Pink one I would love to sell! I bought mine based on a few reviews I came across. I figured the price was right too. What a waste!! It wasn’t cycling and stove piped a few of those times. I called the company and they had me send it back. They wouldn’t cover shipping to return it. They Replaced Barrel, Replaced Trigger Assembly, and Replaced Extractor. I went back to the range and still had a problem with cycling. It doesn’t fully load. This time no stove piping. A guy at the range tried with less problems. Told me to hold tighter. Sorry, I’m a petite female who isn’t as strong. It’ll sit in my safe because it’s useless. Thankfully I have a another 9mm to use instead. The only thing i can say, the first shot each time that did work, was accurate. I got one as a promotional gift and I’ll probably throw it away. Total piece of crap. My Wife and I both have this pistol. 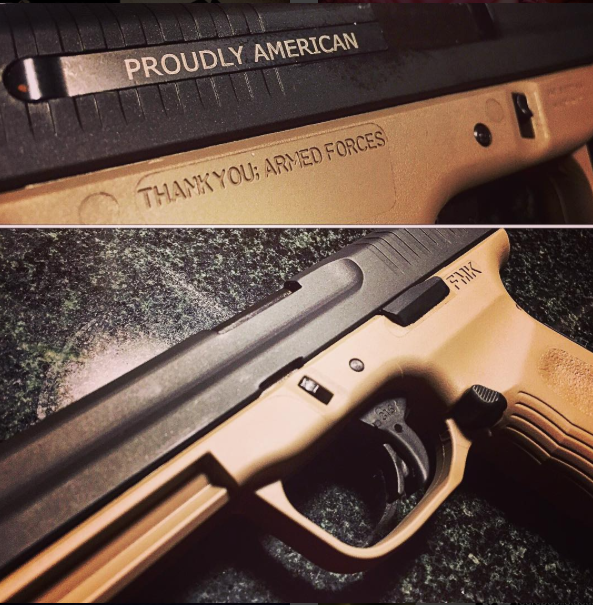 Mine the Patriot which was bought used. New extractor cured its issue. That cure led to me selling my Taurus 92 AFS so she could get another in Her preferred color. We both later went to the range and had VERY minor issues with first mags. We are very excited to train together with a comfortable and quality made firearm!! I received this as a program gun. I enjoy shooting it, however, I have a problem with the slide not fully returning to the battery position when firing. It also tends to hang up when I rack chamber a round. I have also noticed that the polymer is breaking down where the barrel meets the frame inside the gun. Has anyone else had these problems? I have only put about 300 rounds through it, which could be a reason that it doesn’t go back to battery position, but I think the visible wear is a problem. Ralph, I just got back from the range where I used my program gun for the first time. I don’t know the proper vocabulary, but I think mine was having the same problem you describe. It fired nicely, extracted, ejected, loaded, but not completely…I would say that it needed less than 1/8 inch to go to be completely ready. Nevertheless, out of two mags, it happened at least 7 times (25%). I want to like the gun. It feels super. Shoots very nicely. But is not ready to fire the second shot far too much. I had such high hopes for this Company and their product and service let me down. I truly wanted to support a local Firearms Company and shelled out well over $ 400 for a Hot Pink 9mm for the wife to use in 2014. Went to the range and out maybe 50 rounds from 3 different boxes of ammo, it went “bang” just a few times. FTF was the theme of the day. Contacted FMK and they will NOT stand behind their product. All they had to say was that it was shooter error and would never take responsibility for the fact that I was sold a piece of crap. I own a Glock 17 which has never had an FTE for FTF and will throw any type of ammo down range. Have a Springfield XD-40 that does the same thing with great accuracy. I brought it to a local Gunsmith and paid him to go through the firearm and could not figure out why it was giving me a problem either. Needless to say, the next Gun Buyback one of our local PD’s has, this thing is getting turned in. GLOCK Clone ~ Enough Said !!! We have 3 of these, plus I had a gen 1 that I gave to my father. The first 100 rds on two of them resulted in the slide not going into battery multiple times. After 100 rds they run flawless. The third pistol was having multiple failure to feed. That was narrowed down to a bad magazine from the gen 1. I wouldn’t trust any gun until I had fired a few hundred rounds through it. After 100 rds these guns have had zero issues and each has about 500-750 rds through them now. My 14 yr old daughter shoots hers without any limp wristing issues. There may be some bad ones out there,certainly I got a bad magazine, but 4 out of 4 for me. The gun points well and really does feel great in the hand. Accuracy is ver good too. It shoots as accurately as my sig p226 and better than my gen2 Glock 17. I will continue to use the pistol and recommend it. Brad, do you suggest putting the 100 rounds through the gun in one setting? I was quite disappointed after my first use of the gun. But, if I just need to put more rounds through it, I can put up with the “Failure to Return to Battery” if that’s the right term. I have had my 9C1 since 2014 and like it very much. It doesn’t like Winchester white box or 147gr Ranger JHP, but it runs fine with Winchester 124gr PDX +P and every other brand of ammo I have run. Feels great in the hand. The DOA trigger is horendus (I live in California where 11 round in a magazine is just to dangerous for civilians to own) but the FAT trigger is fine. I heard great things about the new Elite trigger and am buying one tonight. I think FMK gets a bad rap from bias people. Most are gun snobs and some are people having minor issues that are often easily fixed. A lot of the time it even ends up being user error and then they crap on the gun. For those who have limp wrist issue, you can adjust the recoil spring so the gun functions properly for you. Even the best manufacturers have defective guns come off the line that require work to get them running reliably but the gun snobs just write it off, but a low cost firearm has a few lemons and they are all junk. Hyprocracy. I had run a thousand or do rounds through mine and told FMK I was concerned about the firing pin breaking and they sent me a new one at no charge. I would say if your interested in picking one up do it. The reality is ANY firearm can malfunction out of the box. I just purchased the 9c1elitepro and shot 100 rounds of 115gr&124gr and had failure to go into battery 95% of the time. I did send a request to customer service as to what I can do to fix this problem , they have not responded yet. I believe maybe a stronger guide rod spring may help. I hope they know how to fix this problem.